eBook sales statistics for October 2009 have been released from the Association of American Publishers (AAP) who collects these statistics in conjunction with the IDPF. Trade eBook sales were $18,500,000 for October, a 254.3% increase over October 2008 ($5,200,000). Calendar year-to-date sales are up 180.7%. October 2009 wholesale trade sales were $18,500,000 which is the highest single month thus far. 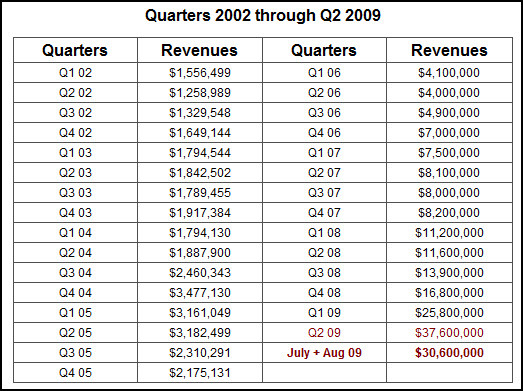 July 2009 wholesale trade was the previous high at $16,200,000. In other words, these numbers are probably understated if anything (provided you ignore the fact that Amazon apparently sells the bulk of its eBooks below wholesale cost). Your humble blogger notes that while these year-to-year increases are indeed impressive, the Association of American Publishers, while not yet announcing October sales, has released September’s figures: “Book sales tracked by the Association of American Publishers (AAP) for the month of September increased by 12.3 percent at $1.26 billion and were up by 3.6 percent for the year.” He would also note that while he cannot find the eBook sales number for September 2009, the statement above from IDPF indicates that it must have been below $16.2 million, claimed as the previous monthly high. As such, eBook sales in October were less than 1.3% of overall book sales (although there is no doubt some finagling to be done to balance retail and wholesale numbers). We are once again reminded that there are lies and damned lies. And then there are statistics. As the following chart shows, “triple what they were a year ago” means $35 million+ versus $11 million+. 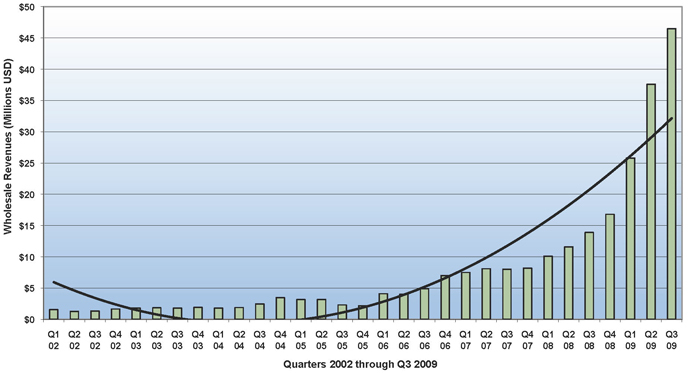 Although Q1 ’09 was about 2.5 times Q1 ’08, let’s just assume that the whole of ’09 will be triple of all of ’08. 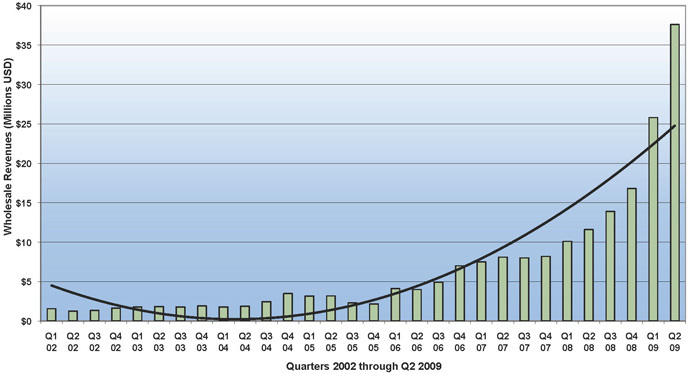 That would suggest 2009 eBook sales of at least $150 million. No spare change, but as I’ve pointed out elsewhere, this remains little more than a rounding error for the book publishing industry as a whole, representing still less than 5% of anticipated 2009 total print sales. Let see when Spelt Flakes put Cheerios out of business, and when eBooks kill the printed book business.